As you know I recently picked up an iPad to conduct a usefulness review for a client. This particular client is a schoo district that wants to use the technology in a PE classroom to streamline instruction to their students. While we are still researching the opportunity for them, I have purchased some of the more popular apps that are available for the iPad that are relevant to the multisport lifestyle that I lead. If you want to read up on the review of the TI Swimming, iMapMyRide, and pro cycling tracking apps, click here. In all my training efforts, I haven’t ever tracked my nutritional habits. I don’t have a tough time losing weight, so in the past all I have done is decrease the serving size of the foods I eat, quit drinking Coke, and I will drop pounds. In the last three months before Ironman St. George I did cut out most dairy to get my body fat percentage down to about 7.0%. But I didn’t track what I ate to measure the daily caloric intake or the quality of the calories I was eating. I always found the process cumbersome and wasn’t aware of a good tool to accomplish the goals that I wanted. I wanted software that was simple, intuitive, and that did not require that I enter every single ingredient to make its calculations. I didn’t think I could get the detail I wanted out of a program while balancing that detail with simplicity. I bought this app on a suggestion from a friend. I looked at the reviews on it in the iTunes store and thought that with so much positive feedback, the program must rock. I downloaded it and when I opened it for the first time, I was impressed. The layout was intuitive and it even made sense to a non-techoweenie like me. This isn”t the start-up screen, but it is the daily summary page. On it you can input the foods that you eat and the software has most every food that you can imagine in a database that already has the nutritional values included. You have to trust that the information is accurate, but from my experience so far it is. This element of the software is only as good as the information that you put into it, so if you want it to accurately track the number of calories you consume, you need to use the app for every morsel you put into your mouth. There is also an exercise tab where you can input the amount of physical activity that you achieve in a given day. The tab has a section that will allow you to input the number of calories that you burn during specific activities, which is nice for multisport athletes. I know how many calories I burn during each swim, bike, or run, so I do not need to rely on the preset values they have as part of the software. I think this element of the app is solid because it does give you the flexibility — if you are a data junkie like me — to enter data as you see fit. 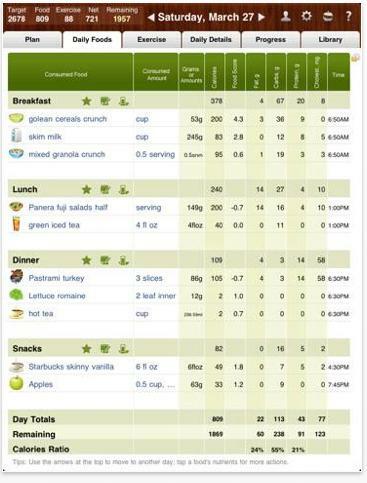 MyNetDiary takes away one of the barriers to successful calorie tracking. Inherently, this app is on your iPhone or iPad, which you more than likely take with you everywhere anyways. I have constant access to my iPad and my wife has an iPhone, so entering data right after a meal when it is most convenient is a snap. I haven’t tried using the iPhone and the iPad to enter data on the same account, but I am sure it is possible. You data is uploaded to the MyNetDiary servers where you can make it either public or private. I like accountability, so I opted to make mine public. There is an entire community that is very supportive according to the corporate website, but I haven’t gotten too much love from that group yet. I think you get out of it wheat you put into it, and I haven’t spent time encouraging others in their weight loss efforts so I shouldn’t expect hundreds of daily emails from the online community. There is one limitation that I do not love about this app. To enter data you are required to be connected to the Internet. As I travel as much as I do, I do not always have access to a wifi or 4G signal. So the app is a web-based application. I am sure the company had to program the app this way to make as many tools available as possible without clogging up your memory on your iPhone or iPad. Personally, I would like the iPad app to download the database so I could enter my caloric intake and physical activity when I am offline. The information could upload to the servers when I do get online. If you don’t have an iPhone or iPad, then you can use this tool at the company’s website at www.mynetdiary.com and get the same results. But I think that last limitation is nit picking — this is a great tool for those of use who want to track not only their caloric intake, but the quality of their diets as well. I have been using the tool for a couple of weeks now and love it. It has helped me identify the problem areas in my diet (can you say, chocolate Creamies?) and now armed with that information, I know what I need to do to make improvements. With my 2011 racing schedule consisting of lots of bike races that have huge climbs, I need to improve my body fat percentage so I am not carrying any extra weight up over the hills. I think this tool will help me in that quest. Verdict: This is a solid buy. Pick it up if you are interested in determining the quality of the fuel that you are putting into your body. There’s nothing like being healthy. In today’s America, we really need toworkout occasionnaly and get rid off our bad diet habits. It’s not extremely hard. You only need to stick to a diet program and continue until you reach your objectives. I must say i can’t comprehend people that think that they could slim down with diets & pills. Come on , man, come on!!! Its not brain surgery now, is it? Intake less calories than you burn and you will probably lose weight – yes, its that simple!! !